On land, one group of animals dominate the earth. 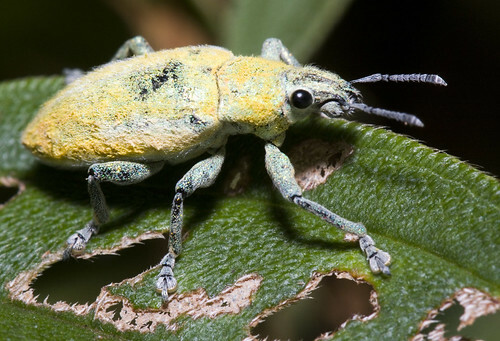 Accounting for 75-80% of all described species on the planet (about a fifth of all known animals are beetles, of which weevils alone outnumber all other phyla except the molluscs), insects have established a niche for themselves in nearly every terrestrial habitat, from frigid mountaintops to the frozen slopes of Antarctica. They float as a living layer of tropospheric plankton that drifts a mile or more above the ground. Deserts, jungles, savannahs, wetlands, treetops, hot springs and caves have endured multiple waves of invasions by nearly every insect order, as have habitats made up of living creatures from hapless humans who brood baby botflies to caterpillars and spiders that get eaten alive from the inside out by fly maggots and wasp grubs. Perhaps their mastery of the land stems from the early ascent of tiny crawlers with segmented legs and compound eyes into the mossy beds of ancient marshes that were no taller than a twig. As Devonian horsetails and lycopods reached heights to rival modern trees, the Insecta radiated with a ferocity unmatched by their supposed sister arthropods the Myriapoda and Arachnids. Their clade was quick to harvest the bounty of spores, seeds and pollen that plants were producing in spectacular excess, first as predators and later as partners who fuelled a mutually-perpetuating race to divide and conquer all the surfaces of the once barren earth with forests of ferns, cycads, conifers and flowering shrubs. Further adaptations such as wings and a life cycle that lets larvae exploit different niches from the adults cemented the rule of the Pterygotes and their metamorphosising progeny the Holometabolans. Even as various vertebrate orders rose and fell, insects further consolidated their dominion by creating complex, self-organising societies that build cities deep in the soil and high in the canopy by the power of pheromones. Other than unfortunate individuals blown far from their homes by oceanic breezes, only five species of striders are known to inhabit the open sea. 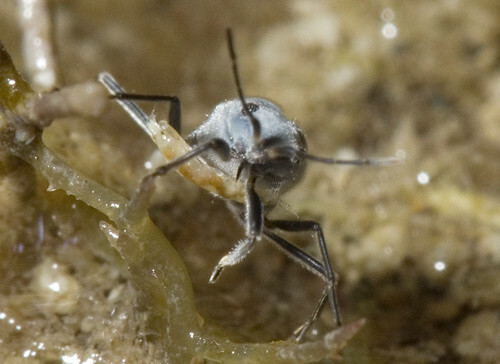 in the intertidal zone, insects are conspiciously rare in both numbers and diversity compared to crustaceans, molluscs, cnidarians and multiple phyla of wormy things that conspire to keep out six-legged upstarts from the waters they left in lost Apart from competition, physiological features that make insects a watertight cuticle of jointed compartments have found no avenues for a return to the life aquatic, at least in marine conditions. Just a couple of hundred or so insect species out of more than half a million live by or on the sea. The most prominent of these are probably the flies that seem intent on taking it out on warm-blooded beachfleas with bites that with luck merely itch for days or worse transmit leishmaniasis, a nasty condition that causes weight loss in unpleasant ways. Unsurprisingly, beetles are fairly successful occupiers of littoral habitats, as far as insects go, with at least 50 obligatorily marine species from 11 families. A similar number of non-biting midges (Chironomidae) are restricted to the intertidal zone, where they have traded flight for sturdy grips. True bugs in the infraorder Gerromorpha are probably the best known marine insects, having drawn the notice of sailors for centuries who pondered the white specks of Halobates as they surf the blue waters on legs that act as both hydrofoils and oars. 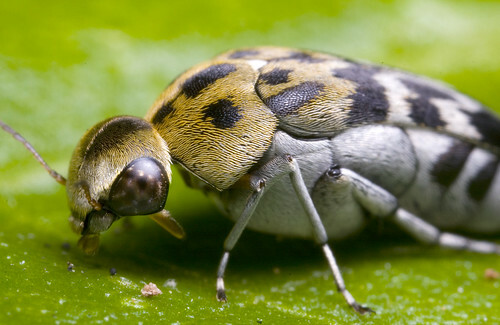 Members of another Hemipteran family, Saldidae, dwell by the seaside and hunt smaller creatures. While shooting a family of clownfish on Sister's Island, my duck retained enough wit to note a minuscule insect (above) that had landed on a outcrop by the host anemone. 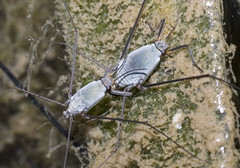 Post-processing revealed that the bug (which may be a Saldid) had in its grasp a crustacean, which was having its juices sucked up by a stabbing rostrum. Not insects sensu stricto, springtails (also and better known as Collembolans, for not all these hexapods bounce on furcula) maintain an obscure presence between the tides. Dense aggregations of dust-like particles can at times be seen in sheltered tide pools, floating on the water's surface and flicking about at random. Colonies of the same(?) species of Neanurid can turn up in unexpected quarters, such as this gathering on a cerianthid, which appear quite unaffected by stinging nematocysts. The peacock anemone lives on a shore that is seldom exposed and so these springtails must have endured a considerable time in the microclimate of small air pockets, feeding in the meanwhile on the protein-rich slime of their host. And in their confinement of close proximities, there was probably little else to do but to eat and make the most out of chance encounters in the dark. For there's no knowing when the waters would spring these captives free to boast that they have loved and lived to tell their tale. Cheng, Lanna (ed. ), Marine Insects, Scripps Institution of Oceanography Technical Report (1976). Janssens, Frans, Department of Biology, University of Antwerp, Antwerp (personal communication).